The Tiger Brands Foundation's in-school breakfast programme provides a healthy, nutritious breakfast every school day to thousands of learners at disadvantaged schools across South Africa. Children are served Tiger Brands breakfast products, which compare favourably with optimal levels of micronutrients as recommended by the World Health Organization and other scientific bodies. Guideline daily amounts of each product are regularly assessed to limit non-essential nutrients in the meals. This helps to minimise the risk to vulnerable learners of developing lifestyle diseases. Our in-school breakfasts consist of enriched sorghum-, maize- or oat-based porridges. Meals contribute positively to the daily nutritional requirements of the learners. Teachers and support staff also receive meals. Learners' dignity remains a key tenet of the programme. Breakfast is served in class while learners are seated, and each child is provided with cutlery and a placemat. The programme is run in tandem with the National School Nutrition Programme (NSNP). The Tiger Brands Foundation is a leader in the space of in-school nutrition. One of our primary aims is to create a national movement around the provision of in-school breakfasts for vulnerable learners. This includes expanding our sphere of influence beyond the learners themselves to include school staff, volunteers and communities at large. In the case of school staff, we work with select partners to deliver programmes to uplift and support leaders. In this way we help to improve their professionalism, teaching abilities, management of school resources, finances and government subsidies. Regular learning forums, held in partnership with the University of Johannesburg's Centre for Social Development, expose delegates to a range of global experts who discuss issues such as social returns on the Foundation's investment, various ways to supplement the NSNP, and the overall impact of in-school breakfast programmes on learners, educators and the communities they form part of. The Tiger Brands Foundation not only works on bettering the nutritional well-being of learners, but also on increasing nutrition education in schools. This empowers children to make better eating choices, thereby contributing to their general health and helping them to concentrate better and participate more during class. 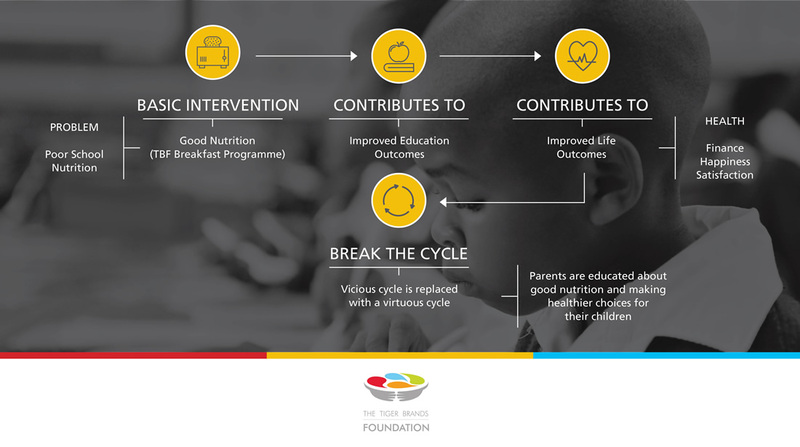 This, in turn, results in improved education, which leads to better life outcomes and an improved chance of breaking the cycle of poor nutrition. The Tiger Brands Foundation believes strongly in developing all the people who form part of our value chain. Principals at our beneficiary schools, for example, are hosted at a conference where leading nutrition experts provide insight and information on a variety of topics. Training is also provided to the volunteers who are appointed by beneficiary schools to work as food handlers. The Foundation pays these volunteers a stipend for the work they do in preparing the meals. We also ensure they receive training on food storage and preparation, as well as general hygiene and kitchen safety. The training programme for volunteer food handlers is accredited by the Culture, Arts, Tourism, Hospitality and Sport Sector Education and Training Authority (CATHSSETA). This provides them with skills that are officially accredited, allowing them to explore career opportunities and increasing their employability. Learners also receive good advice while they eat their breakfast. The placemats that they receive at mealtime contain a printed information guide that reinforces topics such as hygiene, nutrition, and social recommendations. We also provide educational posters for classroom walls, which we recommend for life orientation classes. The Foundation recognises the importance of establishing good nutrition infrastructure to help schools provide healthy and hygienic meals. We also undertake infrastructure development where necessary, either by upgrading existing facilities or providing new kitchens in the form of customised shipping containers or brick and mortar structures.